I've mentioned on more than one occasion what a fan I am of Beaujolais. Beaujolais is the red of summertime. It's best served slightly chilled, is light in body, and pairs with a huge array of summertime foods. Cold cuts, cheeses, grilled or roasted chicken, pork -- any of these stand tastily next to a slightly chilled glass of the stuff. As I mentioned last time -- Beaujolais is one of the few wines that will complement pretty much any salad, regardless of what you're throwing in the bowl -- thus, an essential around this household! As a quick refresher, Beaujolais is a province within Burgundy. These wines are all produced from the Gamay grape and are fermented through a process called carbonic maceration. In this process, grapes are piled into a tall, vertical container pumped full of carbon dioxide and yeast is added. Rather than crushing the grapes and fermenting the resulting juice in the presence of oxygen, most of the sugar is fermented while still in the grape skin. This process creates some unique flavor compounds. Beaujolais -- These wines are produced from grapes grown anywhere within the Beaujolais region. Beaujolais-Villages -- These wines are produced from grapes grown in one of thirty-nine villages in the southern part of the region, known to produce consistently high quality wine. Beaujolais Cru -- There are ten villages known to produce the best wine in the region, and the wines are designated simply by the name of the town. Come summertime, I usually have several bottles of Beaujolais-Villages and cru lying around. However, when this season began, I went to the French aisle to stock up and got smacked in the face with an unpleasant surprise. All of the prices went up -- and not by a little...by a lot. Last year, a bottle of DuBoeuf's Beaujolais-Villages could be had for $6-7. This year, it was $11-12, and the 1.5 liter bottle was $20. When I asked about the price hike, I was given some explanation about shipping costs, exchange rates, and so on. I shook my head, since most of the other wines from around the world (including most French wines) have maybe gone up in price by 5-10%, not 100. My theory? Beaujolais' popularity started to skyrocket over the last few years, and Georges DuBoeuf decided it was time to cash in. DuBoeuf is the leading producer in the Beaujolais world, and the prices of these wines often follow the lead. A few years ago, a bottle of the aforementioned Beaujolais Nouveau was in the $7 range. Now, they're selling for more than some crus, after a huge marketing blitz by GDB. I looked for other light red alternatives. I discovered a pretty good substitute in the J.Lohr 2006 Wildflower Valdiguié. This wine was marketed as Gamay, until it was discovered that Valdiguié is a slightly different grape. But "slightly different" in this case is of the same degree as the difference between Miley Cyrus and Hannah Montana. The flavor of this Monterey County wine is almost indistinguishable from a Beaujolais-Villages, dark in color, fruity in flavor, and with a soft tannic finish. I started keeping this around a fair bit. The DuBeouf 2006 Beaujolais-Villages was marked down from $12 to $8. It's still very much the pleasant wine that I remembered. The nose was soft mint and cherries, and the flavor is one you can throw down without too much thought. A great wine to break out with dinner or just on a warm summer evening. Finally, the DuBeouf Domaine de Grand Croix 2006 Brouilly had dropped from $17 down to a much more respectable $13. The nose of this one is very pretty -- cherries and lavender. The flavor is very well-balanced from an acidity standpoint for Beaujolais. The finish is fruitier but a little more tannic than many in this family of wines. If you were doing grilled chops or other pork dishes, I'd probably recommend this one. 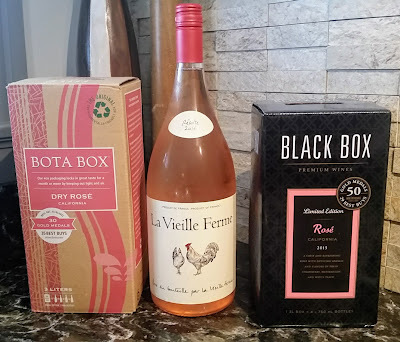 Bottom line, while making a profit is obviously the goal of any winemaker -- pushing too far can lead to trouble...although finding good wine on sale is certainly a thrill for this wine drinker! Also, this wine writer's going to put things on hold for a bit. I'm off on a muchly needed vacation for a few weeks to recharge the batteries. If you need some other ideas for wines or other general information, please poke around the tasting index and see what you can see. Many thanks to the Cockney Rebel for this heads up. As many of you know, I have a sense of uneasiness about Wine Spectator, Robert Parker, and the like because of their "objective scale" of wine ratings. Regardless -- they have a lot of pull in the wine world. They also give "Awards of Excellence" to restaurants that are deemed to have top notch wine lists. Summertime. Fresh vegetables and herbs. All the natural yumminess you’d ever want, there for the taking at your local farmer’s market or in your backyard if you’re lucky enough to be able to keep things a’growing. I know that I focus a lot on what to eat with grilled food during seasons like this, but I’m just as likely to want something light when it’s blazing hot. I’m perfectly happy with a big ol’ dinner salad most nights, but that doesn’t change the need to indulge my little oenological fixation. Salads are tough for wines, though. Greens of almost all sorts have at least a hint of bitterness in their flavors. Some, like arugula, can be absolute wine killers that make a decent bottle of chardonnay taste like turpentine. Also, as delicious as fresh vegetables can be, flavors leap off in any number of directions and throw off many flavors in wine. Roasting certain veggies can markedly change food flavors, mushrooms add earthiness, asparagus almost always sets wine on its ear, and so on. Heck, we haven’t even started talking about different kinds of dressing. Or perhaps you want to add meat to your greens to soothe the carnivorous beast within. How can you set up a pairing for optimal dining pleasure while not either making a boring salad or ruining a perfectly good bottle of wine? 1) Go with the acid. Without veering headlong into Timothy Leary Territory, I’ll simply give assurances that powerful hallucinogens and romaine generally do not mix. However, tartaric and malic acids generally work much more effectively. The acidity of tart, crisp wines tends to cut through the bitterness that most greens have, as well as working to effectively dissolve the oils in most dressings, which allows both the flavor of the wine and the other flavors in the salad to make a stronger impression. Almost any crisp wine will work with a salad. And when in doubt, as with any number of other foods, rosé works well. For instance, the Saintsbury 2006 Carneros Vin Gris -- A French-styled rosé from California. It reminded me a great deal of Tavel. The wine has a pleasant nose of strawberries. Body is slightly acidic and quite fruity. Finish has a nice fruit, followed by a crispness that would make it a wonderful pairing with almost any kind of salad you might come up with. $12-14. 2) Pair with the dominant flavor. The idea here is similar to the rule of thumb used when pairing wines with pasta. You wouldn't want to drink a pinot grigio with a heavy tomato and meat sauce, but a big ol' Montepulciano works splendidly. Think about the major flavor in the salad -- or if there's one ingredient that, even if it's just an accent flavor, would be the first thing people taste. For instance, we recently made a tomato salad with lots of Mediterranean flavors: parsley, pistachios, mint, and scallions. While light, the tomatoes and herbs certainly took center stage. After some discussion with a knowledgeable staff person at a local wine store, we came upon the Pierre Boniface Apremont 2006 Vin de Savoie -- This wine from the French Alps is made from a local grape called Jacquère. The nose is cream and apples and the flavor is somewhat acidic and grapefruity. However, much like the wines from the neighboring Loire Valley, you get a some minerality, although not as much as a Muscadet. The body is light and crisp with a slighty flinty finish. A wine like this will cut through strong herbal flavors as well as the acid of things like tomato. $11-13. 3) Spice can be nice, but always think twice. While many think of salads as simply cool and green, adding spice and heat to a salad is becoming more and more common. If you look at the ingredient list for almost any salad in a cooking magazine these days, you're going to run into ingredients in either the dressing or the salad itself that adds peppery, savory flavors to the mix. Thankfully, there are a number of wines that balance those flavors. When it comes to pairing food with spices, Riesling immediately jumps to mind, especially dry Rieslings. The better dry Rieslings are often from Alsace, and one I had recently was The Furst 2006 Riesling – a wine with an interesting twist. The nose is perfumey and appley, much as I expected from a Riesling. Most Alsace Rieslings I've tasted have been bone dry, but this one has a pleasant amount of sweetness, which works wonderfully to balance the flavors you'd find in a salad. Also, the body wasn't as heavy as some Rieslings I've had. If you're doing an Asian-flavored salad, you'd be well-advised to spend $12-14 here. The other major varietal that pairs with almost any salad is Beaujolais, but I'll hold off on discussing those in depth since they'll be the central theme of the next entry. But if you want a red wine with a salad, that should always, always be your first thought. So, enjoy that fresh produce straight from garden to plate -- and confidently pour something that stands up proudly alongside.